Meg and Todd share how to make their favorite sandwiches. Todd: Hey, Meg. Let's talk about sandwiches. Todd: How do you make your favorite sandwich? Meg: Well, my favorite sandwich is called a BLT. Bacon, lettuce, and tomato. Todd: Ooh, that's so good. Meg: Yeah, isn't it? It's very easy to make. First, slice the tomatoes, then toast the bread. Next, spread the mayonnaise on the toast. After that, fry the bacon. Then put everything together and add lettuce. 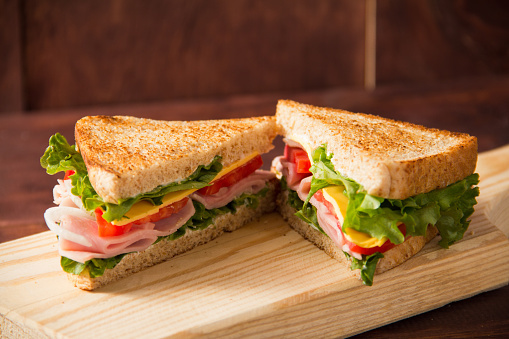 Finally, cut the sandwich in half, and serve it with chips or fruit. Todd: Okay. That sounds great. Let me check. First, slice some tomatoes. Todd: Then get some lettuce. Meg: You do need to get the lettuce, but after slicing the tomatoes, you should toast the bread. Todd: Okay. So, slice the tomatoes, toast the bread. Todd: And then spread mayonnaise on the bread, on the toast. Todd: And then add the tomato and lettuce. Todd: ... and put the bacon on the lettuce and tomato. Todd: I think I can do it. Meg: You can do it. What about you? What's your favorite sandwich? Todd: Oh, my favorite sandwich is really easy but a little unhealthy. It's a peanut butter and banana sandwich. Todd: So, similarly, first, toast some bread. Todd: And then spread peanut butter on one piece of toast. Todd: Then cut up a banana into big slices. Todd: Then put the slices of banana on the peanut butter. Todd: And then put the other toast over the bananas. Todd: So, put the sandwich together. Meg: Wow, it sounds pretty easy. Let's see if I can remember. So first, toast the bread? Meg: Then spread peanut butter on one slice of toast. Meg: After that was cut the banana into big slices. Meg: And finally, put the second piece of toast on top of the sandwich. Meg: I can't wait to try it. Todd: And I can't wait to try the BLT. It gives commands or orders. It tells people what to do. The pronoun 'you' is not needed. You come here! > Come here! Use please to be more polite. The negative form is common. We often use imperatives in positive and negative sentences. Don’t play video games all day. Don’t leave your clothes on the floor.